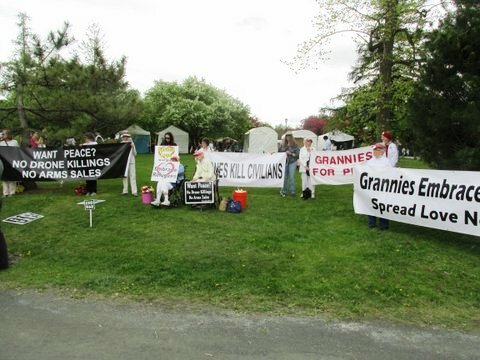 On Saturday May 7, 2016 from 1 PM to 2 PM Grannies for Peace and our allies gathered in Washington Park near the Moses Statue, under available trees on a grassy bank. We tried to wear all white, or at least some white, which is one of the international colors of mourning and also reflects a combination of all the wavelengths that combine to meet our eyes as the color of universal unity. Our vigil was mostly silent, except for interactions with those who came up to us and with a couple of leafleters out in the nearby crowd and on the end of the vigil line. At the close of the vigil we formed a circle and sang a few verses of Pat Humphries’ song, “Never Turning Back.” Then Mabel invited people to leaflet in pairs and gave out small, colorful carnations and leaflets to each pair. 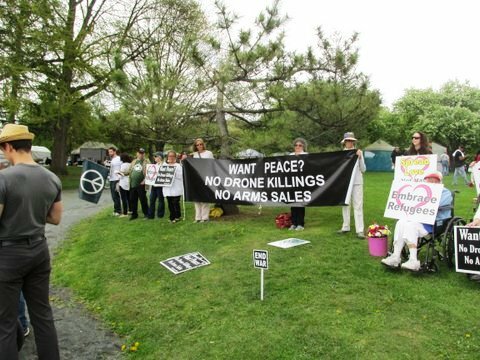 Stop the Wars-Wage Peace-Celebrate the Mothers of the World. In the spirit of Mothers’ day, Grannies for Peace would like to honor mothers all over the world by spreading love not hate. In unity, we call for an end to violence, at home and throughout the world. We call for diplomacy and negotiations to replace drone and bomb attacks in Iraq, Afghanistan, Syria, Yemen and Libya. We call for a US and international arms embargo to end the killing of civilians and the destruction of cities and towns in Yemen, Libya, Syria, Iraq, and Afghanistan. We embrace the refugees created by these wars and demand that our government support them and welcome them as they flee from war. This year we will dedicate our vigil to connecting the dots between our endless and ever expanding “war on terror” and the creation of millions of refugees, fleeing war and violence. 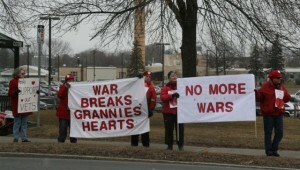 As part of our message, we will display two more banners: “Want Peace? No Drone Killings. 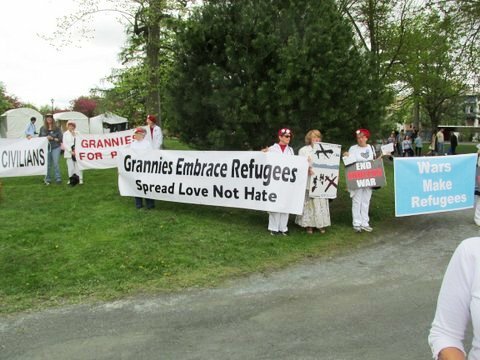 No arms sales” and “Grannies Embrace Refugees: Spread Love Not Hate,” in addition to our Grannies For Peace banner. 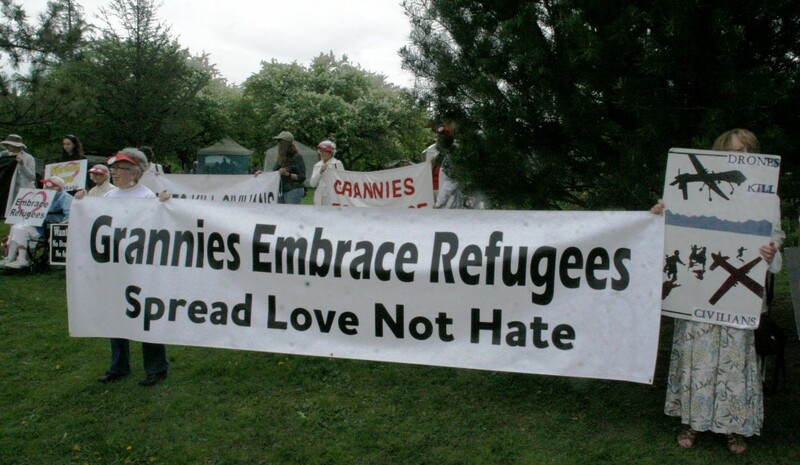 In response to the pervasive political rhetoric, anti Muslim hate speech, and fear mongering, aimed at excluding the refugees from the United States we will also have signs that say: Embrace Refugees, Spread Love Not Hate, and End Endless War. Our basic message is:”Tell Congress to stop unauthorized wars and to institute an embargo on arms sales to warring nations.” To urge others to join in this struggle we will be handing out leaflets after the vigil. 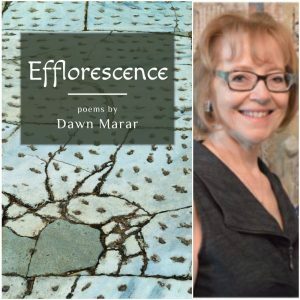 “Flower Power! 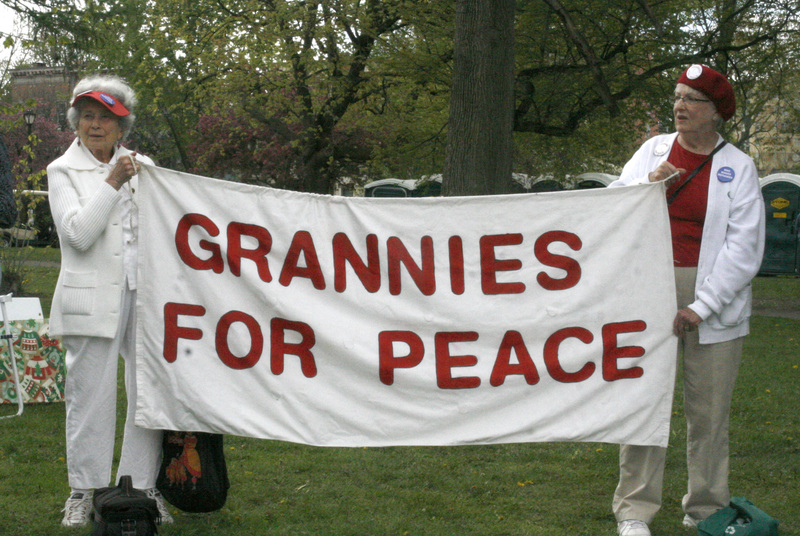 Photos of Grannies for Peace at the Albany Tulip Fest”. 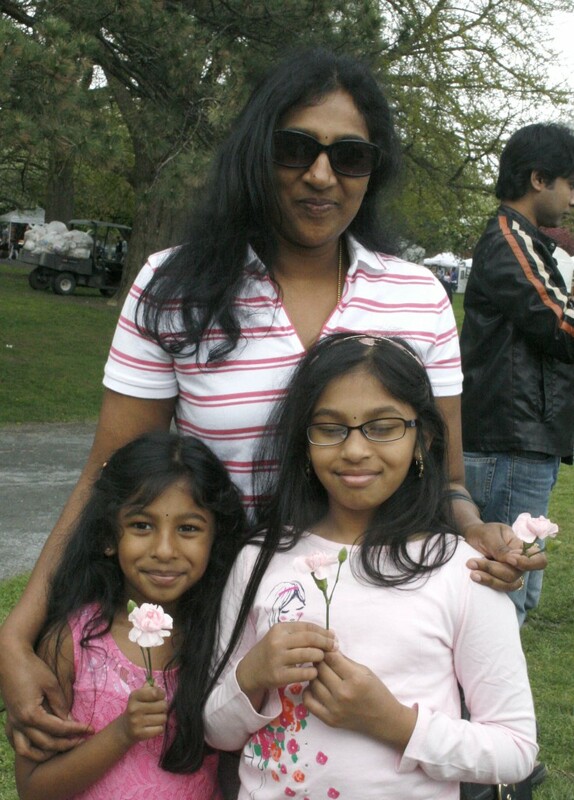 This entry was posted in Grannies for Peace, Support refugees, Working in coalition by admin. Bookmark the permalink.